I thought it would be a nice segue from my last post on the True Range of the Flute to a work that, great as it is, has serious issues regarding range. Composers, if you have overstepped the bounds of the flute’s range, you are in good company. I have heard this played on flute, the 1st player just ignoring the octave indication. If I’m not mistaken, this was the solution on the recording that was made with Ligeti. I did not work with Ligeti on this piece, but have played under conductors who have experience with the piece. What I did was play this passage on piccolo, but that poses another problem later on since there is no time to change back to flute. Our solution was this: 1st player plays piccolo until “l”, leaving out low D-flats and E-flats (they are doubled anyway). Have the 2nd flute play “l” through “m” while 1st changes to flute, then 1st resumes playing at “m”. I solved it by changing to piccolo at “U”. The last time I played it, I thought “what the hey”, and just played from the beginning of the movement on piccolo (transposing the written part down an octave, of course). It makes for better dynamics at “T” (not that it is impossible on flute). The only note you have to leave out is the B in the third bar of “T”. I don’t present this as an authentic or brilliant solution, it was just a whim and the conductor went with it. I hope this helps future flutists working on this cool piece (including myself, just so I remember what we did)! If you know of other solutions, I am all ears. This is going to be a work in progress. 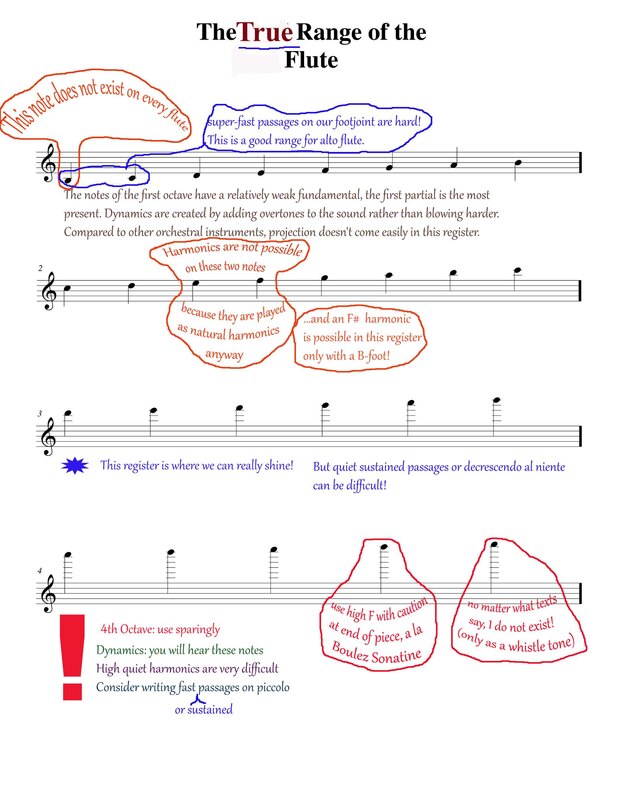 Using empty note heads to indicate air or aeolian sounds. Please see my tips on this subject. Bass flute together with bass clarinet. Neither their ranges nor sonorities match. IMO the bass flute is better paired with the A-clarinet. The bass clarinet is a different animal altogether, with a much broader range, more scope for dynamics, than the bass flute. Just because they are both labeled “bass” (incorrectly, as it turns out for the bass flute, but that’s another story altogether) doesn’t mean they belong together. piccolo and E-flat clarinet ditto. Cliche. Why bother? Unless you want to sound like a screeching street band. Maurico Kagel was able to get away with it. Fluttertongue. It’s also cliche. Give it a rest please. (And it’s not a given that every flutist can do it – Asian flutists have a more difficult time. I myself cannot do the forward version, but have to resort to the Parisian Gargle) And it’s often imprecisely notated, esp. when it comes to mixing the flute and voice. When written together, why are they sometimes written differently? If one does a fluttertongue, the other will automatically do it too – it would be nice to have it reflected in the notation. Extended techniques stacked up on top of one another. This is something some resort to thinking that it will make the sound more interesting and intense. Well, some techniques cancel each other out and just muddy the waters. Better to pick a few that work acoustically well together. Difficulty for difficulty’s sake. 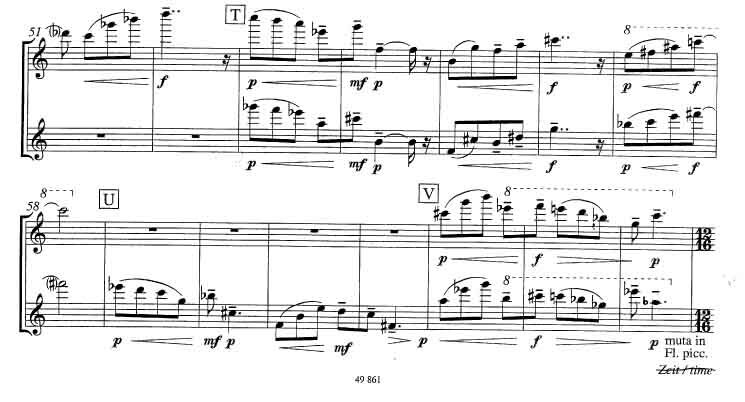 OK, Ferneyhough made it part of the esthetic of Cassandra’s Dream Song – to make the struggle an intrinsic part of the music. But this is a rare case of it actually working (IMHO), I do love this piece but I haven’t come across another that successfully uses this scheme.